Is how the Daily Mail sums up David Cameron’s position in the party conference season-spat over the Human Rights Act 1998. Poor Cam. This is an example of the more right-wing media’s take on the Coalition at the moment, where the Liberal Democrats are painted as the woolly, hand-wringing bogeymen holding Cameron’s Tories back from doing what’s right (and, presumably, what’s right-wing). Interestingly, this was also part of the narrative that the Lib Dems were spinning at their own Conference . . .
“The Labour government that passed the Human Rights Act then spent years trashing it, allowing a myth to take root that human rights are a foreign invention, unwanted here, a charter for greedy lawyers and meddlesome bureaucrats. “This myth panders to a view that no rights, not even the most basic, come without responsibilities; that criminals ought to forfeit their very humanity the moment they step out of line; and that the punishment of lawbreakers ought not to be restrained by due process. “The reality is that those who need to make use of human rights laws to challenge the decisions of the authorities are nearly always people who are in the care of the state: children’s homes, mental hospitals, immigration detention, residential care. They are often vulnerable, powerless, or outsiders, and are sometimes people for whom the public feels little sympathy. But they are human beings, and our common humanity dictates that we treat them as such . . .
Clegg pushes the line that the Government should use it’s chairmanship of the Council of Europe, to push for reform of the European Court – some suggestions on which, were helpfully made in the Bill of Rights Commission’s interim advice and the additional letter. “These are British rights, drafted by British lawyers. Forged in the aftermath of the atrocities of the Second World War. Fought for by Winston Churchill. This has caused some Conservatives to argue that Clegg should be bypassed on human rights decisions. “Mrs May will announce today that immigration rules will be rewritten to set out explicit exemptions which would allow deportation regardless of family. The new rules will direct the courts to give greater weight to sections of the ECHR which allow exceptions to be made. Update: Here is that Theresa May speech in full. Update II: May’s speech has highlighted potential splits in the Conservative party on the issue of the HRA/ECHR. May: “We all know the stories about the Human Rights Act . . . the illegal immigrant who cannot be deported because – and I am not making this up – he had pet a cat. [Except, of course, she is]. Personally the way the conservatives are seeking to tear it apart, I think a bill of rights replacement for the HRA would be more like a clapped out vauxhall viva than a fiesta if it emerges from the bodyshop. At the end of the day, the conservatives want to change it for their own benefit as has been made crystal clear in the statements this week of the home Secretary who’s department seems massively inconvenienced by the HRA, and the Prime Ministers spin and lies regarding the prison van round trip scandal of last week. Change will not be for the benefit of the public, whom I think are actually furthest from the minds of our current government, and further from the minds of government than ever before; the public will be the only losers in this game as the Conservatives seek to remove rights in order to avoid any inconvenience to their current agenda of Hayek / thatcherist based social engineering and rights removal. Any Bill of rights that they produce will undoubtedly still incorporate the articles of the ECHR (as it indeed has to), but will likely make it more difficult if not altogether impossible for those rights to be accessed domestically forcing all to go to the European Court and get mired in years of waiting as they fight their way through their backlog. And this from a government who harped on endlessly about the erosion of rights under the Labour Party; how Duped the UK public have been, every day brings a new tale of rights erosion, from cutting of civil legal aid, to clause 12, to a desire to get rid of the nasty inconvenient human rights act. This is shameful and deceitful political spin, nothing more, nothing less. What I cant understand is if there is a problem with the way that the Human Rights Act works, and arguably there may be, lets talk about amending it, not replacing it. I think Adam Wagner’s point is about the composition of the Bill of Rights Commission, which contains supporters of the incorporation of the Convention into UK law. Whether we think a change would benefit the public or not, without a doubt there is at least *some* public support for what Cameron and May are talking about. Whether they’re going to be able to achieve it is another thing – either politically in terms of the coalition, or ‘legally’ in terms of how the judiciary react. I think this is totally wrong to scarp HUMAN RIGHT ACT 1998. the conservative will the mess of immigration again just like before when they were in power and they will make innocent people suffer of their pain. Human right act is legal right and everyone should have it around the world does not matter where ever they are and this decision I think totally wrong to scarp the human right act and this is against the humanity. I would like ask PRIME MINSTER how would he feel if those Human right(family life) was taken away of him? Thanks for your comments Richard. I suppose the Conservatives would argue that human rights (and the legal protection of them) don’t need to be linked to the European Convention on Human Rights. 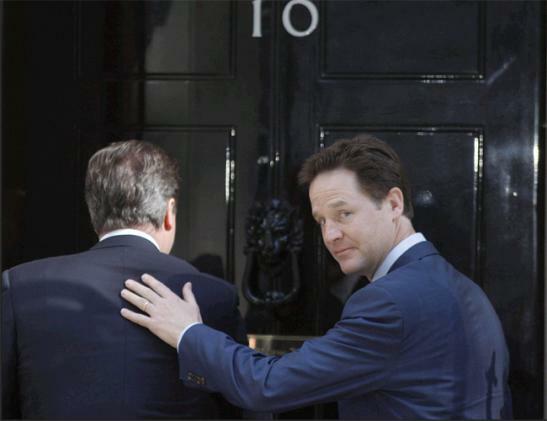 Leave a reply on "“I want to scrap the Human Rights Act but Clegg won’t let me” [updated]"